Long ago, the Ruelen Empire was united under a single banner. In the aftermath of Ruele's Doom, the Empire was shattered, torn apart into nine houses each lead by one of the Emperor's former council. The realm was thrown into bitter conflict, as each of the nine houses vied for power over the others - each seeking to reunite the broken Empire under their rule. 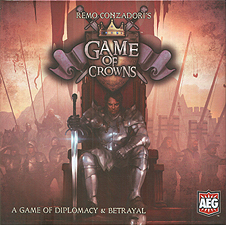 This conflict became known as the Game of Crowns. Each player takes control of one of the nine noble houses. During the game, players can exchange cards and favours through diplomatic relations, or directly attack opponents through warfare in order to take what they want. It will take clever planning, skilful negotiation, and daring confrontations to gain dominance over your rivals and seize the crown!